What is a Religious Sister? A woman religious is a member of a religious congregation who shares in a particular apostolate. After a period of promising simple vows, the sister makes perpetual simple vows for life. These vows are poverty, chastity and obedience. Most of the institutes whose members are called Sisters were established since the nineteenth century. 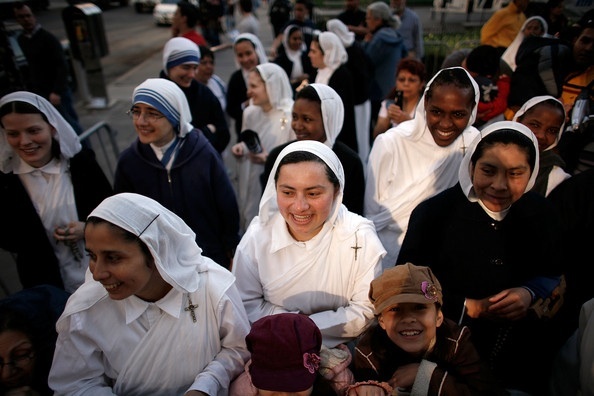 Congregations of sisters typically live and are active in the world. They serve in a variety of active ministries reaching out into the world to assist the Church in a variety of areas: health, schools, parishes, etc. What is the difference between a Religious Sister and a Religious Nun? While the titles are often used interchangeably there is a difference. Nuns take solemn vows of poverty, chastity and obedience and live a contemplative lifestyle most often in a cloistered environment. They live a life of silence and prayer. They engage in some work to help support themselves. A brother is a single, Catholic layman who lives his baptismal commitment by joining a religious community of vowed members dedicated to serving God and those around them. Religious brothers profess the evangelical counsels (vows) of poverty, chastity, and obedience. They also commit themselves to a life of ministry, prayer and Gospel witness within the context of community. What is the difference between a Religious Brother and a Religious Priest? A brother lives in a religious community and works in nearly any ministry: teacher, cook, lawyer, etc. Brothers do not feel called by God to the ordained ministry as priests and deacons are. Thus, since brothers are not ordained, they are not sacramental ministers. A religious priest takes the same vows as a brother and may also work in a variety of positions, but he is also ordained to the priesthood and serves as a sacramental minister. A diocesan priest ordinarily serves the church within a geographic area called a Diocese. He ordinarily serves the people as a parish priest, but he may also be involved in many other forms of ministry like teaching, hospital ministry, campus ministry, or prison ministry. 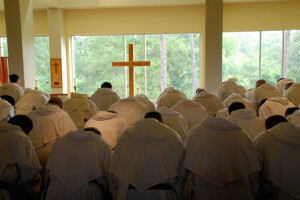 Diocesan priests make promises of celibacy as well as obedience and respect to their bishop. They do not make a vow of poverty, but are to live simply so they can be of service to God’s people. A religious priest is a member of a religious congregation whose ministry goes beyond the geographic limits of any diocese. A religious priest seeks to live a life of poverty, chastity, and obedience within a community of men. The community shares a common vision and spirituality and often emphasizes a particular type of ministry. What is a religious community? What are vows and what do they mean? A vow is a public sacred promise or commitment made to God with the approval of the Church. The vows of poverty, chastity, and obedience are also known as evangelical counsels; they may be taken for one, two, or three years, depending upon the decision of the community and the individual. These promises are renewable for up to nine years. As soon as three years after making temporary vows, a person can make a promise to live the vows for life. Poverty: Poverty is a call to share all goods in common, live a simple life, and depend totally on God. Chastity: Chastity is a call to love and serve God and all God’s people, rather than to love one person exclusively in marriage. A life of chastity is a witness and testimony to God’s love. Obedience: Obedience is a call to live in community and to surrender one’s own will to the will of God. In community, religious listen to their superiors and the voice within to discern God’s call for their life. What are the formal stages in joining a religious community? The time frame is dependent on the religious community but always includes: Postulancy or Candidacy; Novitiate; First Vows – Temporary; and, Final Vows – Perpetual. How do religious communities come to serve in a Diocese? Religious communities can be invited by the Bishop to come and serve in his Diocese, or the head of a religious order may request that the Bishop of a particular diocese allow that community to come and serve within the diocese. In both cases the religious order serves with the agreement of the Bishop.